Babylonian amora; born about the close of the third century; died 339 (see Academies in Babylonia). His father, Kaylil, was the brother of Rabbah bar Naḥmani, a teacher at the Academy of Pumbedita. Abaye's real name was Naḥmani, after his grandfather; but being left an orphan at an early age, he was adopted by his uncle, Rabbah bar Naḥmani, who nicknamed him Abaye ("Little Father"), to avoid confusion with his grandfather of the same name, and thenceforth he was known as Abaye, without any other title. It is a curious fact that he perpetuated the memory of his foster-mother, probably a slave in Rabbah's household, by mentioning her name in many popular recipes and dietetic precepts, some of which seem to be based on superstitious notions. He introduced each recipe with the phrase, "My mother told me." Abaye's teachers were his uncle Rabbah and Joseph bar Ḥama, both of whom successively became presidents of the Pumbedita Academy. When Joseph died (333), this dignity was conferred upon Abaye, who retained it until his death some five years later. Rabbah trained him in the application of the dialectic method to halakic problems, and Joseph, with his stores of traditional lore, taught him to appreciate the value of positive knowledge. Superior as Abaye no doubt was in his dialectic analysis of halakic sentences, he was, nevertheless, surpassed in this regard by Raba, with whom he had been closely associated from early youth. To the disputations between these amoraim we owe the development of the dialectic method in the treatment of halakic traditions. 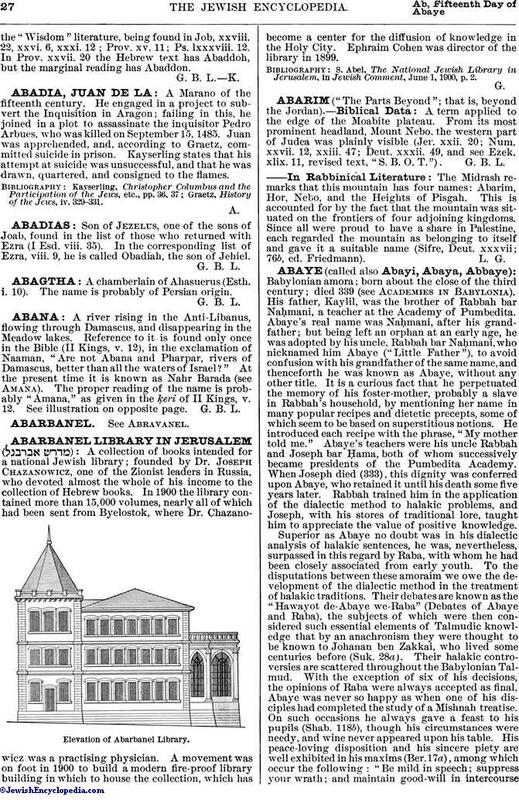 Their debates are known as the "Hawayot de-Abaye we-Raba" (Debates of Abaye and Raba), the subjects of which were then considered such essential elements of Talmudic knowledge that by an anachronism they were thought to be known to Johanan ben Zakkai, who lived some centuries before (Suk. 28a). Their halakic controversies are scattered throughout the Babylonian Talmud. With the exception of six of his decisions, the opinions of Raba were always accepted as final. Abaye was never so happy as when one of his disciples had completed the study of a Mishnah treatise. On such occasions he always gave a feast to his pupils (Shab. 118b), though his circumstances were needy, and wine never appeared upon his table. His peace-loving disposition and his sincere piety are well exhibited in his maxims (Ber. 17a), among which occur the following: "Be mild in speech; suppress your wrath; and maintain good-will in intercoursewith your relatives as well as with others, even with strangers in the market-place." Abaye urged his disciples to conduct themselves in such a way as to lead others to the love of God (Yoma, 86a). 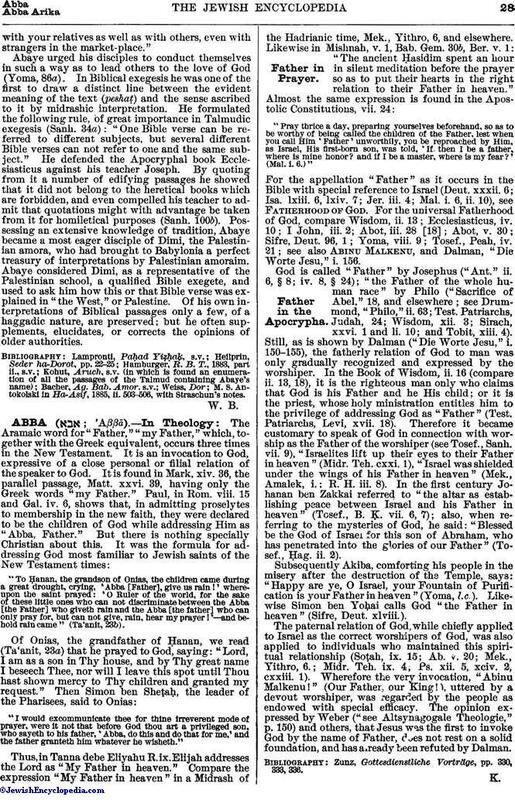 In Biblical exegesis he was one of the first to draw a distinct line between the evident meaning of the text (peshaṭ) and the sense ascribed to it by midrashic interpretation. He formulated the following rule, of great importance in Talmudic exegesis (Sanh. 34a): "One Bible verse can be referred to different subjects, but several different Bible verses can not refer to one and the same subject." He defended the Apocryphal book Ecclesiasticus against his teacher Joseph. By quoting from it a number of edifying passages he showed that it did not belong to the heretical books which are forbidden, and even compelled his teacher to admit that quotations might with advantage be taken from it for homiletical purposes (Sanh. 100b). Possessing an extensive knowledge of tradition, Abaye became a most eager disciple of Dimi, the Palestinian amora, who had brought to Babylonia a perfect treasury of interpretations by Palestinian amoraim. Abaye considered Dimi, as a representative of the Palestinian school, a qualified Bible exegete, and used to ask him how this or that Bible verse was explained in "the West," or Palestine. Of his own interpretations of Biblical passages only a few, of a haggadic nature, are preserved; but he often supplements, elucidates, or corrects the opinions of older authorities. M. S. Antokolski in Ha-Asif, 1885, ii. 503-506, with Straschun's notes.